are now available in The Bookstore. Summer is, above all else, about travel. Finally thawed after months of cold and an uneven Spring, we throw open our doors and head out into the world. Hopping across the globe or just to the coffee shop around the corner, summer is about getting away from here to somewhere else. Very often, books accompany our flight from these hyper-familiar confines. Some people take their time selecting reads that will uniquely match their destinations. Others quickly run through a list of recommended titles and stop at the most compelling title or blurb. Whatever the case, in short time, location and book will begin to influence one another. Despite the inherent silence of author-to-reader interaction, literature is a creature of its surroundings. Books allow a reader to explore locations unfamiliar, while with a circular momentum, the reader’s own environment shapes and intensifies the appearance of those distant places and the people and events that inhabit them. 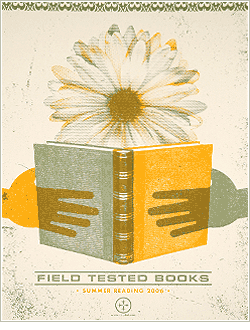 The Field-Tested Books project is our version of the Heisenberg principle: reading a certain book in a certain place uniquely affects a person’s experience with both. The writing you’ll find here is grounded in that idea. You won’t find any book reviews here. You’ll find reviews of experience. Thanks very much to all the writers for so generously sharing their thoughts with us and also for the nice reviews in Time Out Magazine and The Christian Science Monitor. May this summer hold many more such stories for us all.